Hi there. First time here. I am from Canada. 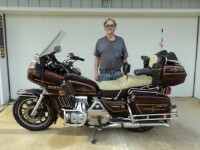 I love Goldwing. 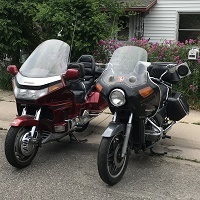 I am looking to buy Goldwing. Bike I am interesting, odometer shows 7,746km. It might year of 1982 or 1983. Person who post on website is not owner so he is not sure what is the year of the bike. I checked pictures they send me odometer doesn't have 100,000 range. So I am guessing 99,999 km after start from 0km and now is 7,746km? 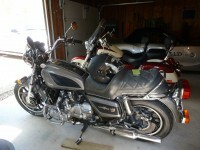 More than 30 years and it is the Goldwing it's not make sense to me. I need your help here guys. Not the owner posting it for sale? I have a bridge for sale...goes across the Mississippi River..Has some damage..
Hi . I talked the person again and he is sure bike has original 7746km. I am still not convinced. Is there anyway I can check odometer to find out if numbers have been roll back once or twice? Not really...If you want to know it's basic condition...inspect it.look for telltale signs of wear. Levers,brake pads and rotors,foot rest rubber,foot brake,fork tubes.7k miles won't have much wear on these parts.A heavy used bike shows the wear spots. This was the case on one I bought anyways.Still pulled hard(compression around 150psi) but the foot peg rubber was worn down smooth and so was the shifter peg rubber.Rotors had significant wear groves.The grips we're worn smooth as we're the levers.The fork tubes had plenty of leaking and scuffing.Obviously not a bike with 32k miles...More like 132k.Still a good bike tho.Oxidation on the aluminum was normal for it's age and no reflection of miles. Hi Everyone. So I went to check bike. It was not good condition and I am not so convinced about low km as owner said. Coolant was leaking from water pump housing, both mufflers were leaking bad, lots of rust, brake caliper might seized too, very low on brake fluid so maybe brake pads, last tires. One thing good was alternator output, battery volt was 13V at 2000 rpm. It also has Honda original fairing but side and top bags are from Vetter. I think this bike needs restoration. I was car mechanic so I am better than average Joe but I am concern about price of parts and availability. If you have done restoration would you tell me how much you spend on bike? Thank you. You do not tell us what price he is asking. However I am thinking if exhaust is shot, fork seals leaking etc. (will not pass a safety inspection, assuming your province requires one)) that this bike has at least the 100,000 on it maybe 200,000. Likely needs carb work, for sure timing belts, new tires etc. I bought my bike with 72,000 km on it two years ago and it had none of these issues. The seller is a scammer/liar IMHO. You must see the writing on the wall. I say stay away-far away from this bike. If the bike is selling for $300 - $400 may work for you. RED Flags are still flying on this. Make sure you get the title and bike before forking over your money. links to my 2 bike records: Shold give you an idea for parts, honda part number and prices. Make sure you scroll down to see all the threads on this. Last edited by Wilcoy02 on Tue Nov 06, 2018 5:13 pm, edited 1 time in total. Very interesting read on the parts and work done to your bikes Wilcoy. And I agree that for 300-400 bux Transfer of ownership docs included the OP can't go too far wrong. He can part it out at that price if things get too costly. Just hope he realizes you are giving USA prices. Here in Canada(where the op lives) they are more expensive by at least a third on the conversion to US greenbacks plus shipping adds up quickly if he has to go the Ebay route or get parts from a US supplier. For example a retired mechanic friend is doing a rebuild on an 83 Aspy's brakes for a customer. I know parts and labour are going to be at least $400 and that is bargain priced labour. Parts are $286 plus taxes. Just saying that things can go South in a hurry. I believe the OP would be much better off looking for a bike in better shape. I even note that the charge system shows 13V at 2000 RPM and he calls this a good thing?. I am thinking he should be seeing approx 14.3V. Just my 2 cents worth. Still interested in what the asking price is? They are hoping for $2000 and then I thought bike is not even worth $500 but I don't want them angry so I told them $1000 then walk away. I am not thinking about buying it. Have a good day everyone.